Home » News & Events » Food, Glorious Food! The Food, Glorious Food! exhibit at the Bellefonte Art Museum for Centre County celebrates the local natural resources of Central Pennsylvania that grace our tables. The art installation runs from June 1 to August 31 in the Windows on the World gallery and includes sculpture, photographs, paintings and botanical drawings created by 20 museum artists that all relate to food. Hands-on culinary activities throughout the summer engage chefs, farmers, and local experts in an effort to connect the public with our culinary identity. Each month of the summer, one fruit and one vegetable is highlighted with programming. June featured wild mushrooms and strawberries. 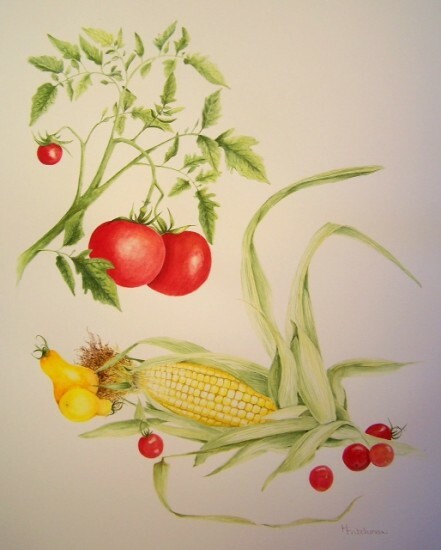 July will focus on garlic and blueberries and August, tomatoes and corn. BAM artist Holly Fritchman created the botanical series and donated an original to remain on silent auction throughout the summer with proceeds to benefit the museum. A Let’s Move! museum, the Bellefonte Art Museum for Centre County hosts free and public monthly Family First Sunday receptions and workshops that will continue the food theme through the summer. 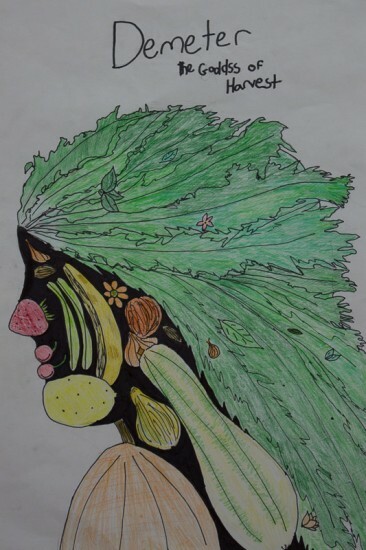 June’s Vegetable Mask-making activity proved popular with the more than 300 attendees who snacked on vegetables and fruits while watching the children create art. July’s Family First Sunday will be held in the museum’s “Garden of Eatin” and will showcase edible flowers and how use them. The August Family First Sunday will be a block party in front of the museum on historic Allegheny Street and will feature a popcorn workshop with a heritage cob corn. A Food, Glorious Food! companion “cookbook-let” containing articles and recipes about local people and what they grow, forage or catch will launch on July 9 in a digital format that can be downloaded for free through iTunes. Real fruits fuel the mask making workshop at the June Family First Sunday open house. 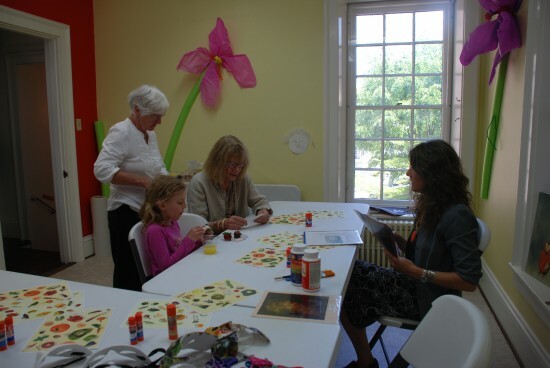 Museum director Pat House, seated on left, with granddaughter Harper House and Connie Levine examine the materials prepared by Carrie Lyons, a registered dietician, artist and program innovator at the museum. The BAM also has three week long summer camp programs for children aged 6 to 10. The first one, Gooey You II, concluded on Friday with a reception that included pickles that the campers made during the week. Gooey You II campers created Fruitfaces during their camp week at the Bellefonte Museum. Museum member only events are designed to grow the membership which is a modest $30/per individual or $40/per family. Members can attend any or all of eight special events for free, thanks to a generous gift from a museum patron. A workshop took place on June 8 at the Shaver’s Creek Environmental Center with an illustrated lecture on local mushrooms, followed by a walk in the woods to search for them, and a cooking demonstration. On the night of the June full moon, a tapas dinner and wine tasting that featured late spring/early summer local foods such as ramps, morels, asparagus, trout and bison was held at a mountaintop residence and attended by 50 members. 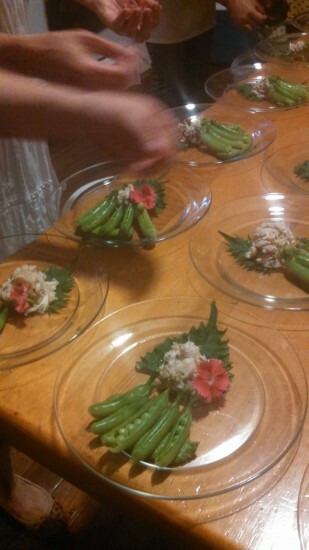 A fresh pea puree anchored sugar snap pods that bared their peas, topped with a shiso leaf with crabmeat and a pink dianthus blossom. Upcoming members only events include a garlic harvest at a home garden combined with a wood-fired al fresco pizza making demonstration, a blueberry picking outing and potluck, an August early morning corn harvest sampling, and an heirloom tomato tasting. The series concludes on August 31 with a pig roast in the vaults of the historic Roopsburg Brewery, operational until 1885. For more information about the Bellefonte Art Museum for Centre County visit their website, Facebook page, or download the brochure for the Food, Glorious Food! exhibit.